Some of the images of the Samoa Events Ford Warrior Race at Lalomanu on Saturday. 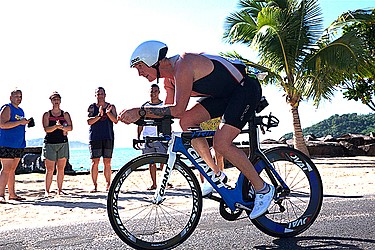 The race is the only Half Ironman distance triathlon in the South Pacific Islands. It has been running since 2013. Athletes for this year’s race came from New Zealand and Australia who used the race to condition for the I.T.U. Age Group World Championships at the Gold Coast in September. There were a few locals that competed in the shorter Beat the Heat event solo - Kat Riley, Samasoni Nimarota Maoga, Ty Feekings, Elia Lasa, including teams. The visiting USO Bike Ride ministry contributed seven teams for the race. The Event is held every year at the end of July on the Saturday before Samoa Swim Series events. Next year’s race is already attracting registrations a year in advance.